to teach sustainability through real world project-based program. Houston, Texas, March 23, 2018 – EcoRise, a nonprofit curriculum and training provider based in Austin, is proud to provide an extended project-based curriculum in their largest educational partnership to date. 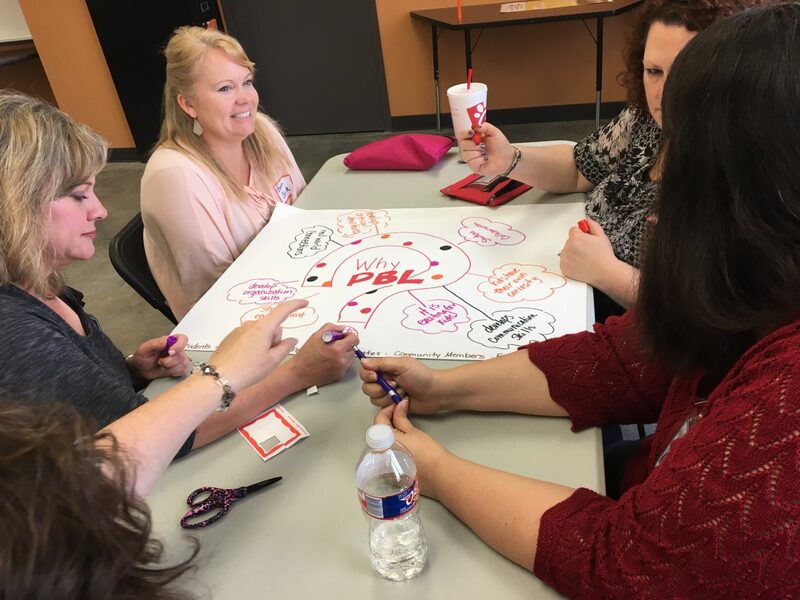 Designed as a three year district-wide program, the PBL Academy held at Tomball Independent School District provides students with authentic tasks and demonstrates how multidisciplinary programs, coupled with sustainability education, can make a lasting and positive difference today and for generations to come. Described as “shifting traditional paradigms of academic instruction,” EcoRise’s program includes a full-featured suite of training and support as it builds a long-term relationship with the school district’s administrators and teachers. “Our team works incredibly hard to provide teachers and students with access to the absolute best in instructional programs, sustainability, design, and curriculum,” says Gina LaMotte, Founder and Executive Director of EcoRise. “Partnering with Tomball ISD gives us the opportunity to provide a district-wide, sustainable program that will continue to instruct students through the coming years,” she added. The innovative training provides instruction to administrators as well as teachers and includes an in-depth introduction to PBL methodologies. EcoRise’s PBL methods stress that learning is not about the product, but the process in which students come to a conclusion and are encouraged to solve real-world problems. EcoRise equips teachers with a framework that is perfect for cross-disciplinary integration; aligns to standards; helps students develop inquiry, leadership, and effective communication skills; and provides opportunities for student collaboration, and peer-to-peer feedback. This comprehensive review of project-based learning helps educators to better understand the program’s objectives and to achieve success in the classroom. “The level of engagement of our staff, trained through EcoRise, has risen because we see that they have a better understanding of what project-based learning really means through the different steps,” said Dr. Martha Salazar-Zamora, Superintendent of Tomball ISD. As part of the District-wide program, teachers and administrators have access to the Learning Lab platform, bilingual K-12 Sustainable Intelligence curriculum, EcoPreneurship suite, and the Design Studio curriculum. In addition, there are connections to the community that allow for onsite and virtual guest speaking opportunities and student project assistance through EcoRise’s national network of authentic audience partners. What further differentiates the EcoRise program from others is the Student Innovation Fund, which provides funding to data-driven student projects. Recently, EcoRise awarded their first Student Innovation grant of $461.74 to a class of 1st grade students lead by Rachel Grimes and Sarah Cobb. The 1st graders designed their project as part of a PBL experience and plan to use the funds to turn unused outdoor campus space into an outdoor learning space by planting a butterfly garden where all students can observe life science and ecology in action. Watch their application video here. Both in and out of the classroom, the curriculum is designed to help students understand the concepts of sustainability through hands-on projects that focus on natural resources, the environment, and a number of other topics through the successful implementation of hundreds of standards-aligned lessons. Students are key to the program’s success as it is ultimately designed to help them become part of the solutions needed for a sustainable future. “[EcoRise] is all about doing what’s right for kids, and being supportive through the process,” says Salazar-Zamora. To stay on track, EcoRise also provides Tomball ISD with a yearly impact report to evaluate the program’s effectiveness and improve further strategic planning.